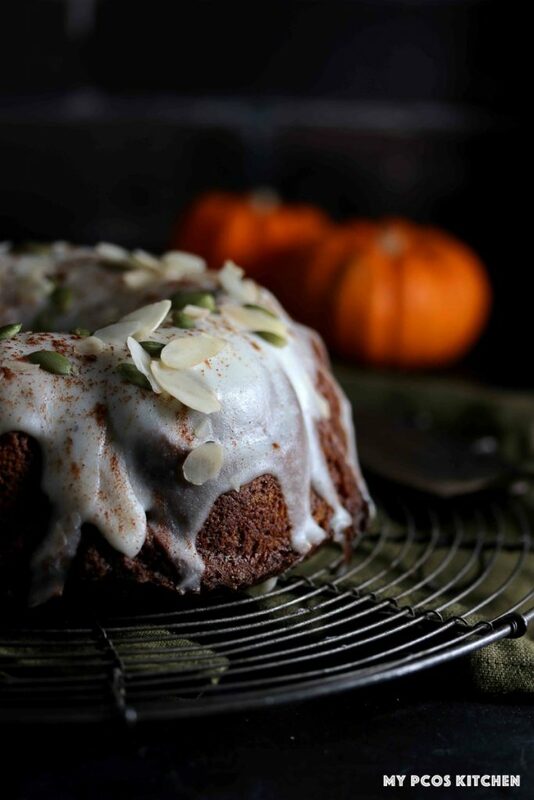 This delicious gluten free pumpkin bundt cake is completely sugar free and dairy free. Covered with a creamy dairy free icing, this is one keto bundt cake you wish you could make every day! Moist, fluffy and crumbly. That’s exactly the type of keto pumpkin cake I wanted to make. Plus one that did not taste like eggs was a huge bonus. 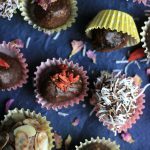 My most recent low carb pumpkin cupcakes recipe was made with whey protein isolate so I wanted to make this next recipe dairy free. Although my cupcakes were also egg free, eggs are absolutely needed in this recipe. I froze half of the sugar free bundt cake in the freezer and brought the other half to work to give to all of my coworkers. No one knew it was gluten free or sugar free, as usual! I always tell them after they’ve finished eating a piece and they’re always pleasantly surprised! 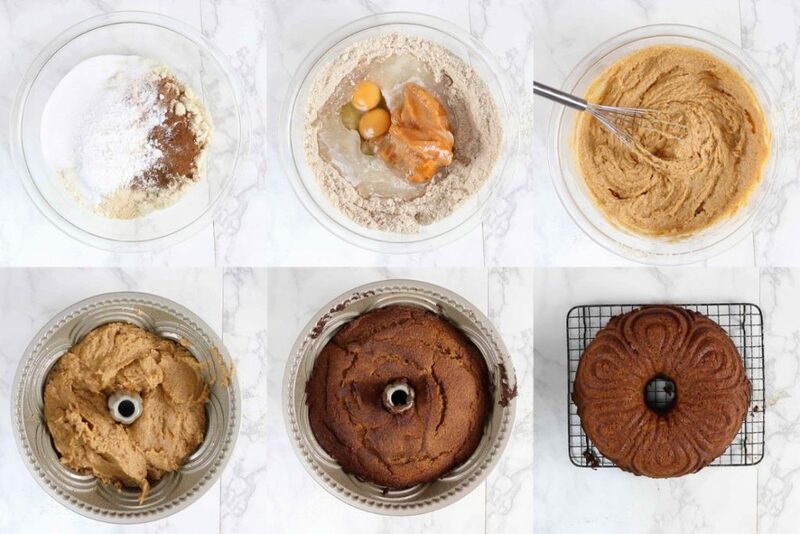 Since I love this pumpkin bundt cake recipe, I wanted to keep some slices for myself, but I didn’t want to eat every single slice in one sitting. I cut the keto bundt cake into even slices and wrapped each slice in saran wrap and froze them. Whenever you feel like a treat, just thaw one piece for a couple of hours and you’re good to go! How many carbs does this low carb bundt cake have? 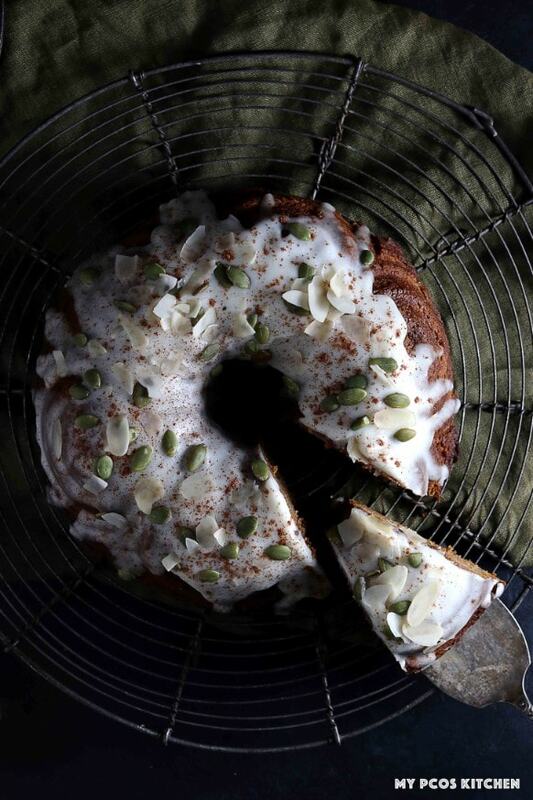 This healthy pumpkin bundt cake makes 10 generous big slices. Each slice has 4.72g net carbs, 7.81g protein, 29.91g fat and 328 calories. This includes the dairy free icing on it. Measure all of your ingredients to make sure that you end up with the same cake recipe as I did. I don’t usually use cups in baking because depending on where you are in the world, the altitude and cup sizes will be different. Also, whether you stuff your cups or not will give you an entirely different recipe. It’s important that you mix the dry ingredients first so that the spices can be evenly distributed throughout the cake batter. Once the dry ingredients have been mixed, you can then add the wet ingredients right in the same bowl. The next steps are quite easy. Just mix everything together, oil your bundt pan, pour the batter in there and bake for 45 minutes! Check the bundt cake at 40 minutes with a toothpick to see if the middle is cooked through. If not, add a few more minutes. Once the low carb bundt cake is baked, you’ll turn it over onto a grill to cool down. I did this while it was hot just in case the batter would stick. It didn’t, but just in case. Let it completely cool down before pouring the dairy free icing over, or else the icing will melt! 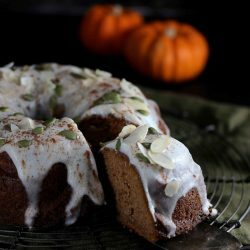 For this dairy free pumpkin bundt cake recipe, I really wanted to use an icing that I could pour over the cake, where it would solidify after. 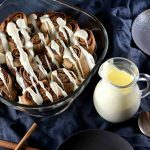 I could have used some dairy free whipped cream and just add a dollop of it over some slices, but I was looking for this specific look and so this dairy free icing recipe was just perfect. All you have to do is mix the ingredients together and pour over the cake! You want to make sure to use powdered erythritol to keep this icing nice and smooth. If you were to use granulated erythritol, your icing would be quite grainy. If you don’t have powdered erythritol on hand, you can make some homemade one instantly. Just add some granulated erythritol to a blender and mix for about 30 seconds and you’ll have some powdered erythritol immediately. Don’t forget the lemon juice! Adding the lemon juice to this dairy free icing not only gives it a bit of tart, but also makes it pourable, which is a must for this pumpkin bundt cake recipe! By mixing coconut butter and coconut milk together, you can make yourself a really thick icing that you can use to fill low carb pumpkin whoopie pies. Want to use another frosting option? If you don’t eat dairy free and you want to frost this amazing gluten free pumpkin bundt cake with cream cheese frosting, then go right ahead! It tastes just as amazing! Just make sure to use some of my keto cream cheese frosting to ensure your keto pumpkin cake stays low carb! 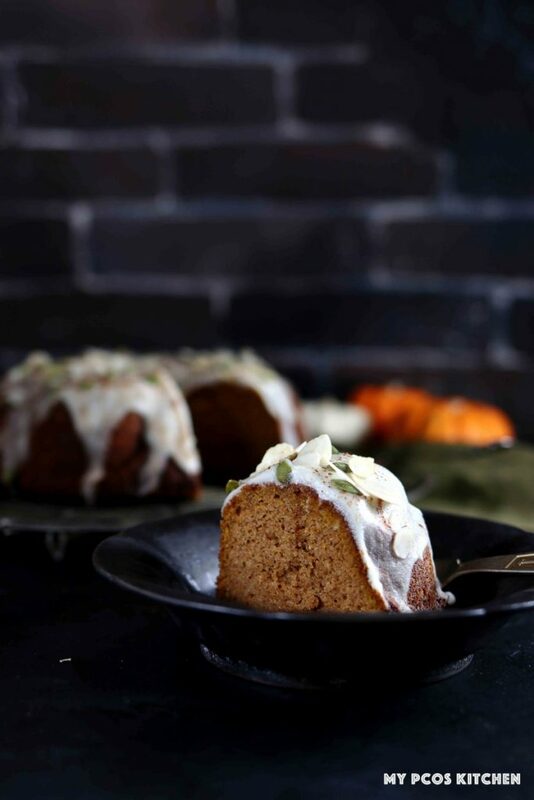 For the more adventurous bakers out there, you must try topping this pumpkin bundt cake recipe with my sugar free caramel sauce. Just imagine it. Pure liquid gold over a moist and crumbly pumpkin cake. What more can you ask for? What sweeteners to use in this keto bundt cake? 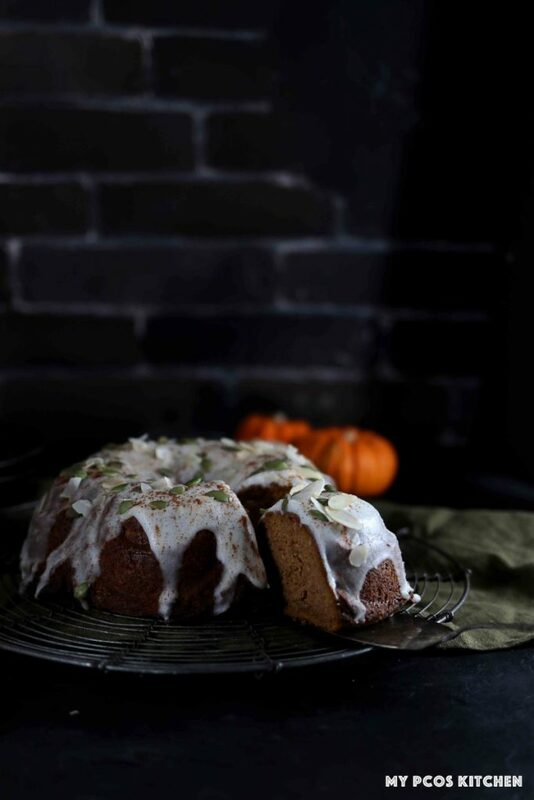 If you’re following a keto diet, you want to use a bulky sweetener like erythritol or xylitol for this pumpkin bundt cake recipe. You can either use a golden blend like Lakanto or Sukrin, or a mix of erythritol and stevia or monk fruit. For a paleo diet, you’ll want to use something like coconut sugar or maple sugar. Is there a substitute for the pumpkin puree? Yes. Instead of pumpkin puree you have many options, either low carb or high carb. 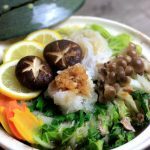 For a low carb substitute, you can use grated zucchini or carrots, or mashed kabocha squash. For a higher carb substitute, you can used mashed sweet potatoes, mashed bananas, or unsweetened apple sauce. Do I have to use a bundt cake mold? No, not at all. You can use any type of cake mold you have on hand. If it’s a silicone one, even better, as it won’t stick. If you use a metal kind, make sure that it’s non-stick and that you oil it really well before pouring the batter in. For this recipe, I decided to use my heavy duty cast aluminum bundt pan that I got while I was in Canada. I love it because it’s non stick and my cakes never break apart or get stuck to the wall. Here are a few tips and possible substitutions for when making this paleo bundt cake recipe. Make sure to use unsweetened pumpkin puree. Pumpkin pie filling usually has sugar added so be careful! Depending on the season, your coconut butter may be hard. Microwave it in 30 seconds intervals and mix with a spoon until the fat and flesh have mixed together once more. Make sure to spray your bundt cake mold with some oil before putting the batter in or else it will stick! Or you can use a silicone one and it won’t stick at all. Instead of almond flour, you can use any other type of nut flour. Instead of coconut oil for the pumpkin cake, you can use any type of fat. Butter, ghee, lard, shortening, olive oil, avocado oil, or even beef tallow will work. A moist and crumbly pumpkin cake that's gluten free, dairy free and sugar free! Mix all of the dry ingredients into a large bowl. Once mixed, add all of the wet ingredients to the same bowl and mix again. You should have a not so thick batter, kind of like porridge. Spray or brush some oil all over the bundt mold. Pour the bundt cake batter inside the bundt mold and spread it out evenly. Place in the oven and bake for 45 minutes, or until a toothpick inserted in the middle of the cake comes out clean. Take it out of the oven, flip onto a cooling rack and remove the mold. Cool completely before putting the icing on. Mix all of the icing ingredients together in a small bowl. Pour all over the cake once cooled. Top with some pumpkin seeds, almond slices and cinnamon powder. Note 1: Instead of 1/2 cup of erythritol and stevia, you can substitute for 1/2 cup of Lakanto Golden Sweetener or Sukrin Gold. For paleo, switch to a sweetener of your choice. Coconut sugar or maple sugar are some options. This cake will stay fresh in the fridge for about 5 days. It can be frozen for up to 3 months and thawed when ready to eat. Super good! Used water instead of milk. I also used 1/4 tsp of Xanthan gum as a binder along with eggs. Used only 1/2 cup monk fruit/ Erythritol blend – by So Nurished. Again, super good!!!!! I made this yesterday with unsweetened Gravenstien applesauce instead of pumpkin because I didn’t have any pumpkin on hand. It is very good in texture and taste, but I will leave out the extra stevia because it is a bit sweeter than I like. I used 1/2 coconut sugar and 1/2 monk fruit sweetener. I’ll try the pumpkin when I get my hands on some. Thanks for a great cake I can serve my whole family, no matter what dietary restrictions they have. I have not tried that so am not sure. I feel you would need a bit more sweetener and the applesauce might be too wet? For the icing, can you use grass fed butter instead of of coconut butter? Hi Megan, I haven’t tried but I imagine it would be really runny and wouldn’t harden because it’s just butter, coconut oil and lemon juice. I really looked forward to this recipe but mines crumbled apart. I thought I followed it to a T. Any ideas why as i would love to try’s this recipe again for company on Thanksgiving!! The taste is fantastic by the way. And I loved your pumpkin cheesecake recipe…wow! 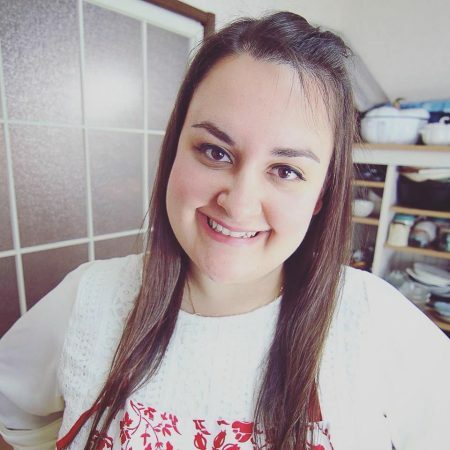 Much appreciation for your great recipes!! Did you do any of the substitutions? Sorry for the delay! No I haven’t. But I did convert to US measurements. It was very moist but didn’t hold together for me. Any ideas before I try again? Thanks again! Hmm, did you weigh the ingredients or used cups? That’s the only thing that I can think of. I used cups. Do you think I needed more almond flour or less? I’m not sure as it crumbled apart but was very moist. Thanks! I feel like it’s because you used cups and didn’t measure the ingredients with a scale? It really shouldn’t crumble apart on you. Could you try using a scale to make it? I don’t like providing the ingredients in cups for this reason. Cup sizes are different in many countries, depending on how high your are, the altitude will affect your baked goods, and also depending on if you stuff or loosely pack you cups, the recipe will be completely different. Hi there, Do you have this recipe in either ozs or grams. I live in the Uk and cup sizes are confusing as we don’t use them here. Sometimes there is a metric or US button to convert. I can’t see one one here. Hi, all my recipes are written in metric as that’s what I use. You can click US imperial if you prefer cups or ounces. 1 cup for me is 240ml, 1/2 cup 120ml, 1/4 cup 60ml. How many servings does this cake make so I can judge the size I should make a slice so t? Hi Maureen, it says in the recipe card. 10 slices for one cake. is the bundt pan you used the regular 10 cup size? I think it was 10-11 cups. I talked about it in the post and linked to it. Can’t wait to try this! You think this would work okay in muffin form? Yep, should be baked at 20 minutes or so. Just double check with a toothpick. I made it tonight, they were delicious. I made 12 muffins and it took 26 minutes to bake. I added some extra pumpkin spice to the frosting because I thought the muffins could use a little more spice.